Help! Where are my Vows? 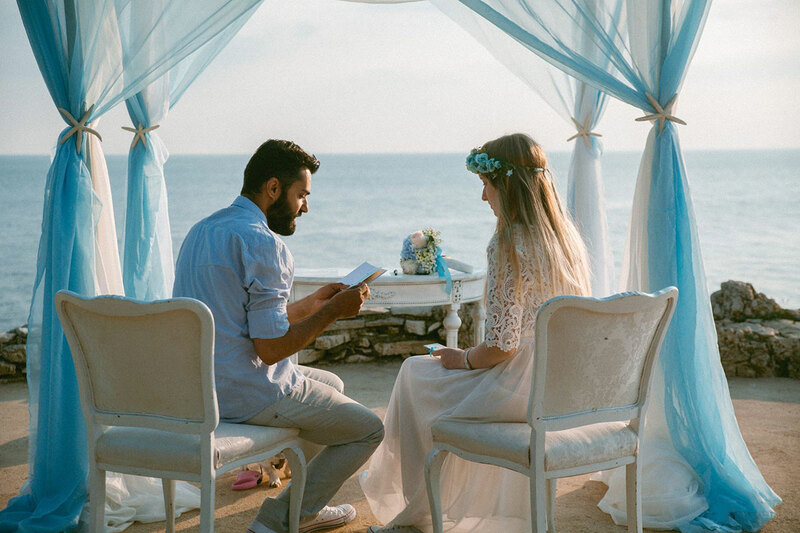 The time has come for you to sit down and write your vows? Do you feel pressured because you want your vows to be perfect? You have so many things to say but the right words are just not coming to you? Maybe you think you are not a good writer? Then you came to the right place! First, clear your mind of any other obligations or activities; you should focus on vows only. Settle in a cozy armchair or at the desk and pick up a writing device that suits you the most. PC or tablets are easy to use, especially because of automatic grammar correction, but we suggest old-fashioned pen and paper. In front of you is a blank paper now. Think of it as a world before you met your loved one – empty. Remember what lacked from your life then. What did your significant other bring to your life? What does he/she represent to you? View some of your photos and write down some shared memories that pop up in your heart. You might remember even a few sad memories, but they just strengthen a relationship. You can write down a list or draw a map of the most important highlights (moments, adventures…) since you met for the first time. Write memories in random order. Don’t panic if it creates chaos of thoughts – that’s the way love works. Simply express everything you feel and think. What are you ready to vow? Secondly, when you write down all highlights you wish to point out in your vows, you are ready to organize them. It is easy to organize them now, but don’t worry about ordering them in a certain manner. Go for a natural escalation of thoughts; order them from the most insignificant to the most emotional. While rereading and reorganizing your thoughts, try to listen to yourself and remember everything you are ready to give up, just to keep your partner close. Love goes both ways, so you have to give, in order to receive. If you understand that, then you are ready to write down what would you promise to your partner. Write down your vows! The vows are not done yet. Now is the time to think of the style you are going for. Should it be funny, emotional, serious, romantic or a combination of those? Also, it is wise to consider what should and shouldn’t be told in front of many family members and friends, no matter how close they are to you. It is important to constantly remember why you are marrying this person while writing vows! Why do you want to spend the rest of your life with him/her and how could you make your shared future better? Still, the most valuable advice is to start writing vows on time. That way you will have more space to think about them, elaborate them and add or remove your thoughts from the vows. It is not an easy task to shrink all your time spent together into one short speech. So don’t spend words on minor details. Don’t let your speech get too long! Rather remove few sentences. It is always better to start writing vows as soon as possible. That way you will have enough time to gather many ideas. In the end it will be easier to pick the best from those. Also, you are not the only one who has to do it; rest assured that your significant other is also pulling their hair over preparing vows. Flammeum is wedding planning agency. There are many services we offer, but writing vows is not one of those. Writing vows is an adventure you have to take on your own. First letter is the hardest to write. There is no template to write your vows, but we hope these guidelines will be enough to get you started.